It is the end of January and I'm happy to report that I was successful in achieving my One Monthly Goal -- I have finished my Wayward Transparency Quilt Top!!! You can see my full post here. 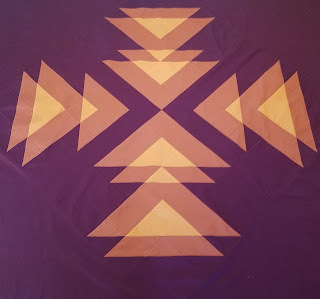 I was nervous to complete the final step because I had never made a quilt using this construction. 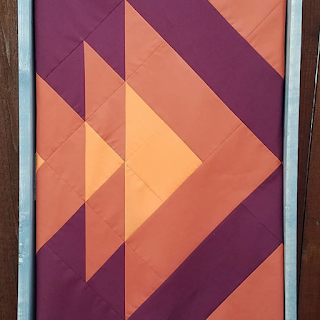 I was worried about cutting the large squares of fabric, then subcutting them into triangles, and then sewing such large triangles onto the quilt. Thankfully there was nothing to worry about!!!! The instructions were very clear and I was able to manage the sewing with no problems. Excited to get this basted and work on quilting it soon. Awesome quilt! Love the colors. Thank you Sherrie, appreciate you taking the time to look! Wow, beautiful quilt, congratulations on finishing it! Thank you, and thanks for stopping by to take a look! You did a wonderful job with your quilt top - it looks amazing. Thanks for linking up with Elm Street Quilts One Monthly Goal and congrats on your finish. Thank you Patty! Love the OMG looking forward to February! Thank you!!! I tend to stick to straight lines since I'm still pretty new to quilting and have a very tiny machine. I'm sure I will do lines with this one too but plan to use the shapes to guide me somehow. I guess we'll see! Very nice Carrie and kind of the opposite of mine! I found that last step a little nerve wracking as well!